I did my last race of the season yesterday at the Scotiabank Toronto Waterfront Half Marathon (affectionately known as STWM). My first goal was to try to break last year’s 1:31, so wanted something in the 1:30’s. As the weeks got closer and I reviewed what this would require as an average pace, I started to think it was too ambitious but that being said last year I did not think I could run 1:31, so I thought….Hmmm, lets just see what the day brings. 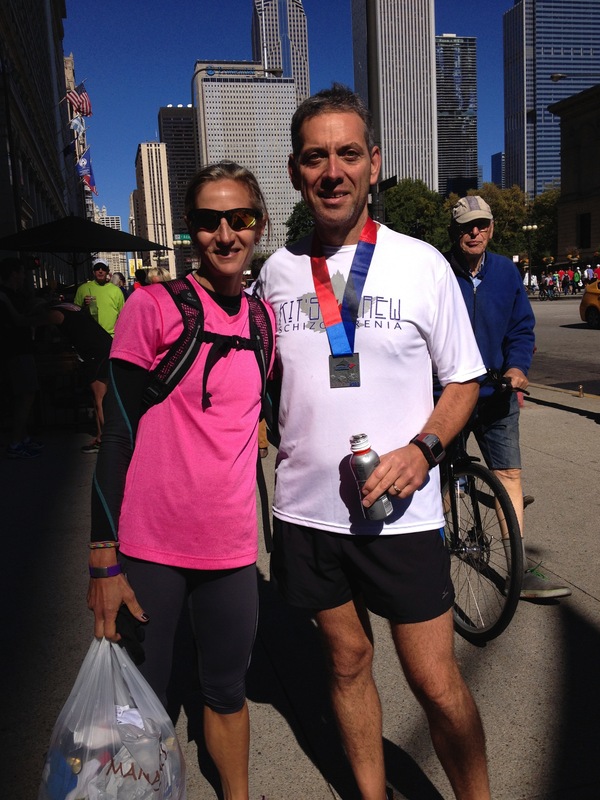 Last weekend, I had a ton of fun cheering my husband on at the Chicago marathon. Not only did I cover about 13km that day, plus my post race shopping and walking the city, but I walked all day Friday/Saturday and half of Monday plus a 15km run on Friday before I left. Likely not the best taper plan leading into this weekend as my legs really felt dead all week except for a really good short interval run on Tuesday. Here we are post race. Saturday I did a quick 5 km run and I don’t remember the last time my legs felt that dead. Far from a confidence builder! I had my usual grumpy pre- race day and thankfully most everyone kept their distance from me knowing that I am not fun to be around when I am nervous and anxious about an upcoming race. This also happened to be my husband’s birthday, so I wanted to try really hard not to make it just about the race, but to make him feel special on his day. He got up early to come down with me and cheer along with his Chicago cohorts which was really nice. However, I was off my regular pre run routine with him around me and shortened my warm up which in hindsight was a bad idea . I went to the corral and usually run back and forth in the corral, but I did not do that either. I kept nice warm clothes on until just before the gun went off which was great. It was a chilly 5 degrees at the start but I knew with the sun out that my Mizuno t-shirt, Breath Thermo arm warmers and calf sleeves I would be just fine. I also chose to wear shorts as I wanted my gel pockets available to me! My first 6km were slow, and it took me about that long to warm up, get a rhythm going. I sort of knew at that point I should go by feel vs. my watch for the rest of the race, but sort of kept an eye on the paces too. In the hopes that my legs would wake up! I also chose to go unplugged from the IPOD for this race, which I am not sure I liked or not. It was neat to hear everyones foot falls and cheers though. At about 14km I really felt my legs get tired, but then I took a gel and got some wind back. I saw my husband again at the 17km mark and got a bit of a burst through to the on ramp at 19, when I slowed quite a bit. Km 20 was pretty good, then the last one was just keeping one foot in front of the other and praying my hamstring would not cramp anymore as it did going up the hill. I kept my head down for the last 500 m and got to the finish in 1:33:48. Shy of my 1:30-1:31 goal but still within my second goal of sub 1:35. I was 4th in my age group, missing 3rd by 40 seconds! That’s like running a tangent too wide or something:). I finished overall in the top 3% men and women included, so I told myself for an old girl that is okay in my books! It’s been a long season and I really had some great results this spring/summer. I was overall really happy with how everything went and I stayed relatively healthy, other than my long term hamstring tendon/hip issue which generally I am told to live with and manage as I can. We had a good day after the race, entertaining out of town family and dinner for my husband’s birthday. 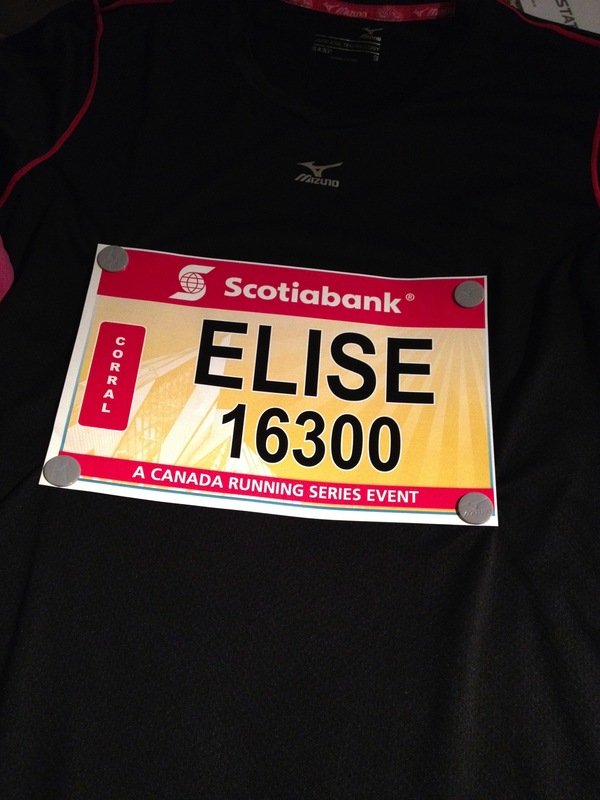 Last event will be the Toronto Women’s 5km with my daughter….basically a walk in the park…. literally!!! Fun way to end off the fall run season.